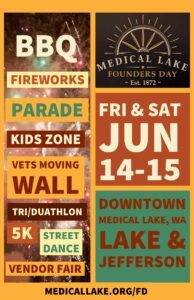 Medical Lake Founders Day Festival is a tradition dating back to 1926, and became an annual event in the early 1980’s. Re*Imagine Medical Lake took up the mantle in 2016 to help keep the Founders Day fire burning! And do we have a show for you! Waterfront Park: Picnic, Bingo, & 10:00 pm Fireworks Show! Enjoy all the festival favorites like the Founders Day Parade, live music, 3-on-3 basketball tourney, and Vendors Fair, Men’s Softball Tournament, exciting additions to the Trailblazer Triathlon: Trailblazer Duathlon, & Trailblazer 5K, Friday Night Picnic in the Park and Fireworks Show, and a most memorable one-time event the Veteran’s Moving Wall exhibit. Founders Day would be impossible without the generous support of our sponsors and volunteers! Thank you! !